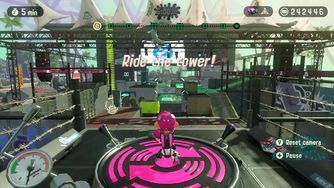 The stage is a Tower Control match in Starfish Mainstage against a team of sanitized Octolings. Two Octolings are using the Octo Shot, and two are using the Slosher. Two use the Sting Ray special, and two use the Splashdown special. Unlike Rad Ride Station, no special is given near the Launchpad that leads to the tower. Fahre auf dem Turm zum Ziel! Let's rock, baby! Ride on the tower to the goal! Dvigai bashnyu! ...They're still washing! This page was last edited on 12 January 2019, at 12:11.